File under "Too Cool Not to Share". 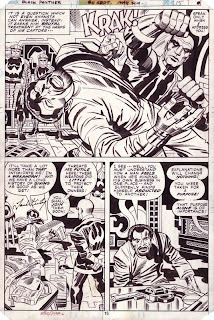 My original Jack Kirby page from Black Panther #11 (Sept. 1978). Inks by Mike Royner. I was taking it out of it's frame to put it in a new one and thought I should scan it for others to enjoy. Note the cut off corners. They used to tape the pages down to shoot them and then to save time, and not have to pull off the tape, they'd cut them.